Special Representative for Afghanistan Tadamichi Yamamoto (left) and Abdul Basir Anwar, Afghanistan's Minister of Justice, launch new report on the country's progress in addressing corruption. 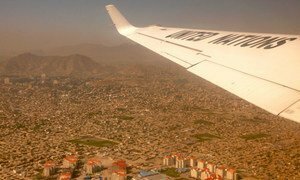 While enormous challenges remain, Afghanistan authorities have made headway in their fight against corruption, according to a United Nations report released today, which also finds that the country is making progress in other areas, such as restoring institutional control over the delivery of public services. “For the sake of the country’s future, corruption in Afghanistan must be addressed and eliminated,” said Tadamichi Yamamoto, the UN Secretary-General’s Special Representative for Afghanistan said in Kabul. He said the UN welcomes the progress already made, and fully supports the Government’s ongoing efforts to fight corruption in the interest of ending impunity, ensuring accountability and transparency, and restoring integrity to the management of public services, finances and natural resources. In its report entitled Afghanistan’s Fight against Corruption: The Other Battlefield, the UN Assistance Mission in Afghanistan (UNAMA), highlights the country’s progress in addressing corruption. Drawing on internationally recognized best practices, it provides recommendations for how the Government, with the continued support of the public and the international community, can build on those achievements. “It is my sincere hope that the progress made so far in the fight against corruption and the recommendations contained in our report will serve as a platform to achieve greater policy coherence and coordination in Afghanistan,” said Mr. Yamamoto, who also heads UNAMA. The report, which the Afghan ministries and judiciary received for input and endorsement prior to release, points out that corruption has affected all aspects of life in the country – undermining public trust and confidence in Government institutions and hindering efforts to bring lasting peace and prosperity to the State. A key component of Afghanistan’s fight against corruption is the Anti-Corruption Justice Centre (ACJC). Its dedicated police and prosecution units, and a new national primary and appeals court, was established by Presidential Decree to operate with jurisdiction over the broad range of corruption offences specified in the current penal code. The Justice Centre’s scope also includes money laundering, destruction or selling of cultural and historical relics, crimes against internal and external security, illegal extraction of mines and land usurpation. Recognizing that the Government’s ongoing anti-corruption efforts have yet to impact the lives of most Afghans, the report makes several recommendations and concludes that – notwithstanding the many legal and policy reforms that have been undertaken – corruption remains a substantial obstacle to Afghanistan’s long-term peace and prosperity. “The report serves as a stark reminder that the fight against corruption cannot be won in the short term, and that the battle requires the sustained commitment on the part of the government and the general public, and full support from the international community,” concluded Mr. Yamamoto. The United Nations envoy for Afghanistan today highlighted both the visible progress the conflict-torn country has made and the challenges lie ahead, urging the Government to redouble efforts while calling for continued international political and financial support.